Ben Qualifies for Eukanuba National Invitational Championship!! Junior Showmanship is completely different from Conformation in that the Judge actually judges the handler and not the dog. Make no mistake about it - many of these kids are VERY good! Junior Showmanship is divided into Junior class (age 10-14) and Senior Class (age 14-18). Though our boys had been showing in conformation for 2 ½ years, they were not old enough to compete in Junior Handling. Our oldest, Ben, turned 10 in August of 2002 and immediately began to compete in the Novice Junior class. It took him only a few shows to get the required three wins to qualify for Open class. Then, in Savannah Georgia, in only his second weekend competing in the Open Junior class, Ben won the Open class and then went on to defeat the Open Senior class winner to win the title of "Best Junior". Since that show, Ben has been awarded Best Junior Handler at the Birmingham, Alabama show, the Kingsport, Tennessee show and the Paducha, Kentucky show. He also won his Open class at the Murfreesboro, Tennessee show. 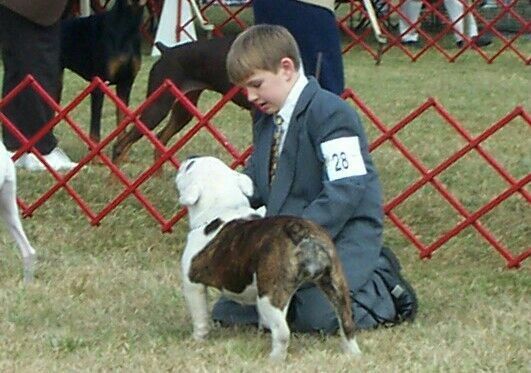 #1 Bulldog Jr. Handler in the country. #15 Non-Sporting Jr. Handler in the country. We highly recommend Junior Handling for kids. Good sportsmanship is stressed heavily and it promotes friendships with other chldren in the sport. After a couple of years of competing in Junior Handling, most kids are far better than the adult handlers in the conformation rings.